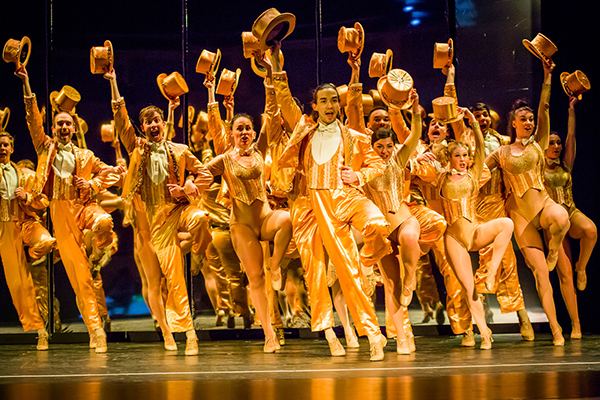 “A Chorus Line” is a deliciously entertaining show. It is an ice cream sundae with whipped cream and a cherry on top. The experience begins with a theater full of people … some chatting, some reading their programs, some showing eager anticipation about the musical they are about to see. The stage curtain is open. Mirrors hang on the upstage wall. The lights begin to dim … a hush falls over the audience. In ambient light, we can see outlines of two dozen figures moving onto the stage. Then, from the six-piece orchestra, the familiar beat: dum de de dum, de de dum, de de dum. It’s the opening number on opening night of A Chorus Line by the Bucks County Center for the Performing Arts. The lights go up, revealing about two dozen young people in dance attire. I know what’s about to happen; I’ve seen this before – multiple times – I get goose bumps, nonetheless. As the dance captain shouts, “5, 6, 7, 8,” the cast dances the routine they have been taught. Some of the dancers are excellent and have learned the steps easily. Others make mistakes. Some will be eliminated. As director Zach narrows the group, sending home some very disappointed young people, the better dancers remain. Some of the performers – at the encouragement of director Zack – tell their deep personal stories about how they became dancers, often with great difficulty and resistance from their families. Zach interviews them one by one, and we are entranced by their stories – how they became dancers – what their dreams are. Sadly, they know Zach needs to eliminate more of them. It’s a dance company, but the individuals represent all of us – our aspirations, successes and disappointments. Each person auditioning for the new company is desperate, but only four men and four women will be chosen. We see ourselves in them; we want them to do well. We care about all of them because their stories touch us. I will return to see this production again because I don’t know when I will see another so exceptional. A Chorus Line is too demanding for most college and community theaters, and seldom is performed by other professional theaters because of the cast size and skilled dancing requirements. The score by Marvin Hamlisch feels urgent. Original choreography by Michael Bennett is exciting. Book by James Kirkwood and Nicholas Dante offers inspirational stories, and lyrics by Edward Kleban are captivating. A Chorus Line has come to life in Doylestown under the artistic direction of Howard Perloff, with solid directing by Jim Raposa who also co-choreographed with Claudia Shell-Raposa. Music direction is by Christopher Ertelt. The production exceeded my expectations. I hope this review persuades you to see one of the few remaining performances of A Chorus Line” today through Aug. 19. (Val), Jordan Weagraff (Mike) and Anthony Wright (Richie/Dance Captain). Other professional dancers in A Chorus Line are Tyler Brennan (Roy) of Lambertville, N.J., Sofia Choinski (Lois) of Bucks County, Dani Cohen (Bebe), Ricky Dieter III (Greg) of Berks County, Matt Gurniak (Tom) of Fogelsville, J. Nickolas Gonzalez (Paul), Mackenzie Jones (Tricia, understudy Sheila, Judy, and Cassie) Ryan Lauer (Frank), Michelle Lemon (Judy), Diane Meck (Connie), Ciara Richards (Christine), Christian Ryan (Mark), Angel J. Sigala (Al DeLuca) of Philadelphia, Riley Vogel (Larry), Jacob Waldron (Bobby), Ken Wasvary (Roy), Lauren Weiss (Vicki) and Olivia Whitehouse (Diana). There are all the familiar songs: “At the Ballet,” “I Can Do that,” “Dance Ten; Looks Three,” “Music and the Mirror,” and the most recognizable one of all, “What I Did for Love.” Every one of the numbers drew enthusiastic applause at Delaware Valley University Life Sciences Auditorium in Doylestown, where A Chorus Line is being presented by BCCPA. Order tickets at 215-297-8540 or BucksCountyCPA.org.